It snowed here Christmas Eve. Unusual kind of day, reports tell is it has been 10 years since we have had snow in the eve! 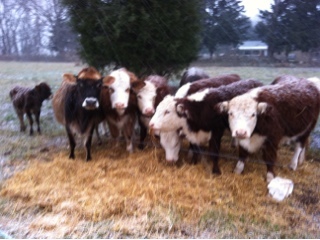 Here, the cattle are coated in snow. 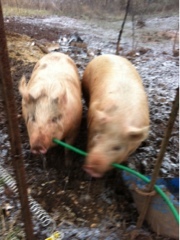 The boar is holding the hose, giving water to the sow. 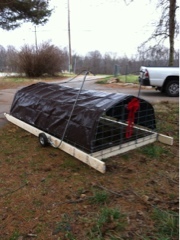 And a Christmas gift of a hog pen is completed with a bow. May your beef be grass fed, your pork, chicken, eggs and turkey be pasture raised and your vegetables be chemical free!